I'm a believer, personally. I think this is the real deal. The acceleration as it left the solar system was the real red flag for me. The lack of a comet tail or comet features also. An incident once happened in my parents' hometown in Italy (in the Abbruzzo region). A close relative of my father recounted the story of one of our distant relatives in the town who was an engineer in charge of operations regarding the turbines. This person was the last to leave the place for the night and as he was traversing the parking lot to access his car, he clearly froze -- couldn't move literally. He was suddenly besieged by a series of very bright lights going on & off intermittently, and all he could do was stay immobilized while looking up at what appeared to resemble an alien craft -- a UFO. The lights kept getting intense and he eventually found himself on the ground with the inability to move. This went on for what seemed like hours. He was found semi-conscious by concerned townspeople who went searching for this missing person, as his wife who was at home waiting for him asked the neighbours to help locate her husband. He was eventually examined medically as he recalled what he could remember about the incident. At first it would have been dificcult to believe such a story, but because the turbines themselves were all damaged-- this was not just an incident anymore but had now become a full government investigation, as well as media coverage. The story also appeared in several US publications including the tabloids of the day such as The Enquirer. We didn't necessarily believe the story at first, but upon further thoughts and the fact of how or who could have damaged those turbines extensively in the manner in which they were, gave this incident some credibility. This happened at some point in the 1970's. The individual (relative) whom this happened to never quite recovered from the effects it had on his health: he suffered temporary and persistent nerve pain to a part of his body and he was left shaken to the core. Eventually though, over time, he did recover but only partially, and he would never ever forget what transpired that night. We'll have to thank the space aliens for making the town temporarily famous. It was at the time, and you could add it is today, still unclear what exactly that really was - a UFO, a top-secret (U.S./CIA experiment, etc.). The Italian government would have be dismissive at the outset if it really were a top-secret gov. experiment. They were just as puzzled and stunned by the effects and the aftermath. The damaging of the turbines affected the town -- shut down the electricity -- something that had never happened in such a wide context before. Definitely something to ponder about. At least Humpbacks aren't extinct yet. 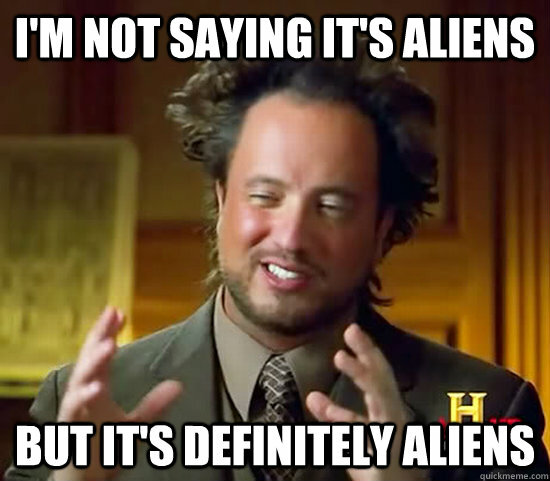 I think Aliens are real in some facet, the chances of us being alone in the universe are ridiculously small.